Mr Edwards' daughter Lisa Prank said the art was "ripped off" by Mr Musk, who said he had offered to pay. On Thursday morning, Mr Musk tweeted a journalist saying: "I offered to pay the guy who drew it twice already for something I don't even want." In response to another tweet, he said: "I definitely care about artists getting compensated. It would be unfair not to do so." 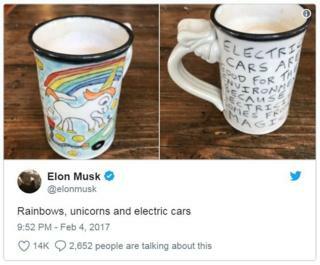 In February 2017, Mr Musk shared the "whimsical drawing" of a unicorn farting electricity to power an electric car which featured on his "favourite" mug. However, the happy relationship came to an end when Mr Edwards' friend bought a Tesla car and discovered the use of a similar farting unicorn. On Tuesday, Ms Prank tweeted to point out Mr Musk, the boyfriend of Canadian musician Grimes, "ripped off my dad's art", and asked: "What do you have to say for yourself @elonmusk?" Mr Musk replied directly to Ms Prank, crediting the design to Nik Jovanovic, another Twitter user. He offered to "change it to something else if your Dad wants". Ms Prank stated Tesla had been using her father's "creative property for a year without credit or compensation". She asked Mr Musk if he thought "artists deserve to be paid for their work", and directed him to a letter from her father's lawyer. Mr Musk described the row as "kinda lame". He said Mr Edwards should be happy "this attention increased his mug sales". "I'd really like to get on Elon Musk's good side," he said. "He's really really interesting. But he isn't above copyright law." He said he was not looking for lots of money but wanted to be paid "adequately" and loved that his design was being promoted by Tesla. Musk's fury: Whistleblower or saboteur?